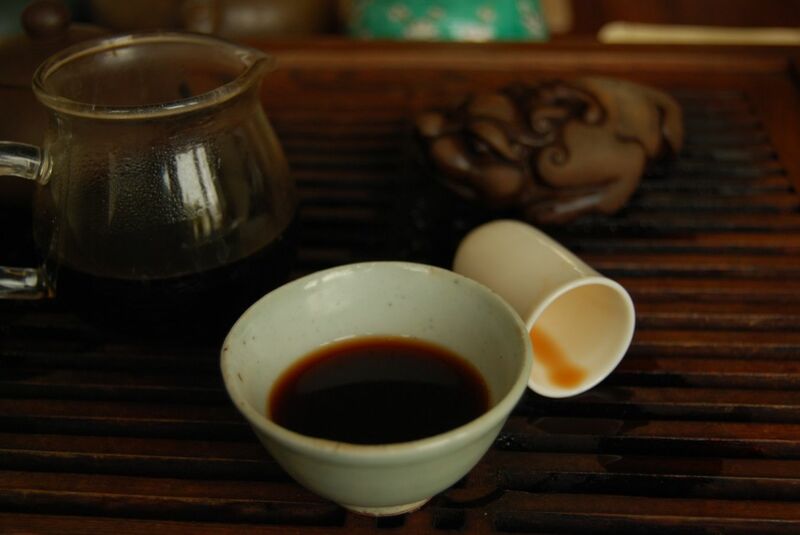 You might remember the 2005 "Daxueshan" from Shuangjiang Mengku. I liked it, back when it was $30. You just cannot (cannot!) argue with prices like that. I recall that Apache and I didn't argue with prices like that, when we got our collective purchase on. These days, Dubs is selling it for $70. You might like to give it a try - that price is looking very nice, for the sheer density of trouser that is on offer here. Now, in 2014, it is sweet and honey-like. (I'm talking about the Dubs version here, by the way, not my own English-storage version.) I love the storage characteristics of this cake, where it is both sharp and mouth-watering, in a fine manner. It is pungent, long-lasting, and I love it. I don't think it's possible to have too much of this cake - it'll always go down well. "Greatest Hits" indeed, and not one to pass by. What was straightforward power back in the day has mellowed into a depth and complexity that far exceeds the asking price. I had to Google the name of this cake: the 2014 "Apple Scruffs", also from Dubs. It turns out that this is the name of an album (of course), from George Harrison, which refers to the post-Beatles groupies who pretty much stalked the ex-members of the group. I haven't heard the George Harrison album, but feel as if I have a good idea of its qualities, based on the other albums that have been turned into cakes by twodog of Dubs. The picture below might give you some idea as to the time of year that I sunk this sample. This is an autumnal cake. I am aware that I usually employ that phrase in the same way that one might say "he's got a nice personality", but, in this case, it all seems to work. 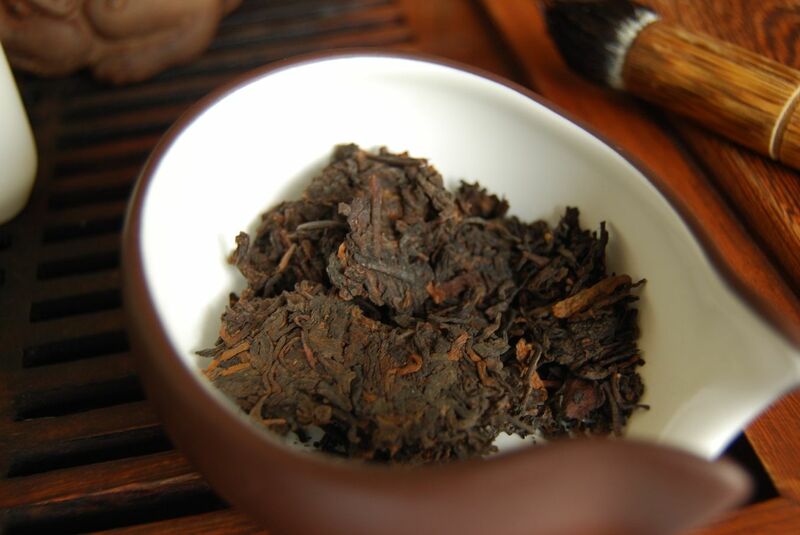 The maocha comes from the Xigui area of Lincang. I am loving the Lincang, longtime, as I seem to say fairly regularly. This cake had everything going in its favour: at the time of drinking, I had just finished the week-long admissions exercise, in which almost all members of faculty have to set aside their work and interview prospective candidates for our undergraduate degrees. It's a huge undertaking, and gets lots of (well-deserved) scrutiny from the press, to ensure that we're doing our jobs and not simply admitting our friends / donors / etc. After that week, there is a few sweet days before Christmas lands. Apple Scruffs arrived in that perfect hour, after hard work and before the holidays. As with many good Lincang cakes, we have yellow-orange (autumnal coloured?) tea which is both fresh and very fruity. It is very decent quality, although my diary notes that "this is very good, but I have several like it". 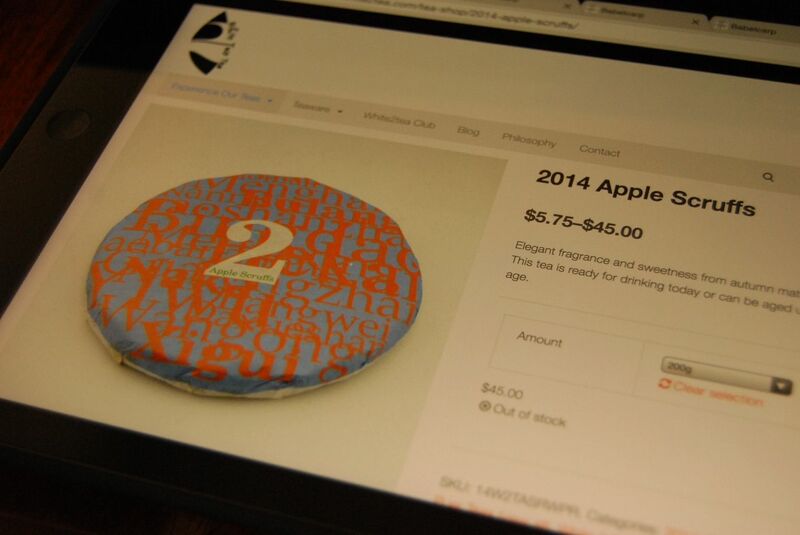 If you're looking for solid drink-it-now Lincang, Apple Scruff is $45/200g and looking decidedly reliable. One of my favourite things about teapeople, which probably involves you, Gentle Reader, is that they are, without exception, "dudes". I don't mean that in the American sense that teapeople have XY chromosomes and a collection of dangling, sensitive organs that nature has chosen to place on the outside of the torso; rather, I mean it in the American sense that teapeople are cool like the Fonz. If your average teaperson were a character in Top Gun, they would be Iceman. If they were a Bond film, they would be Casino Royale (2006, not 1967). If they were a Transformer, they would be Soundwave. If they were an East-Coast gangster rapper, they would probably be Raekwon the Chef, or perhaps Ghostface Killer. There can be no doubt that if they were a character in the Star Wars universe, then they would obviously be Boba Fett. I'm saying that teapeople is Good People. This is an impression that returns to mind when my bulging letterbox spews forth generous teagifts from the four corners of the globe, although mostly from that corner that includes south-east Asia. The first of two such gifts is from William of Bannacha, he of ninjitsu and bushido fame. 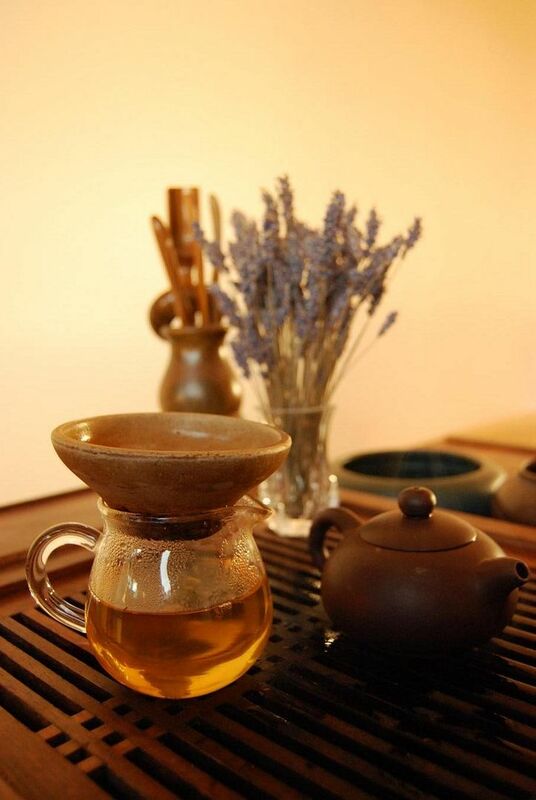 We may recall that he is romantically linked to certain individuals from Jingmaishan, which gives him ample opportunities to cruise the proverbial tea-curbs of Yunnan, looking for the proverbial hot (tea-related) action. On receiving the above post-card from W of B, my youngest son (now two years old) pointed and said "Mama!" I consoled my dear wife with the fact that Xiaolong had, at least, pointed at the youngest of the three ladies on the postcard, pictured above. 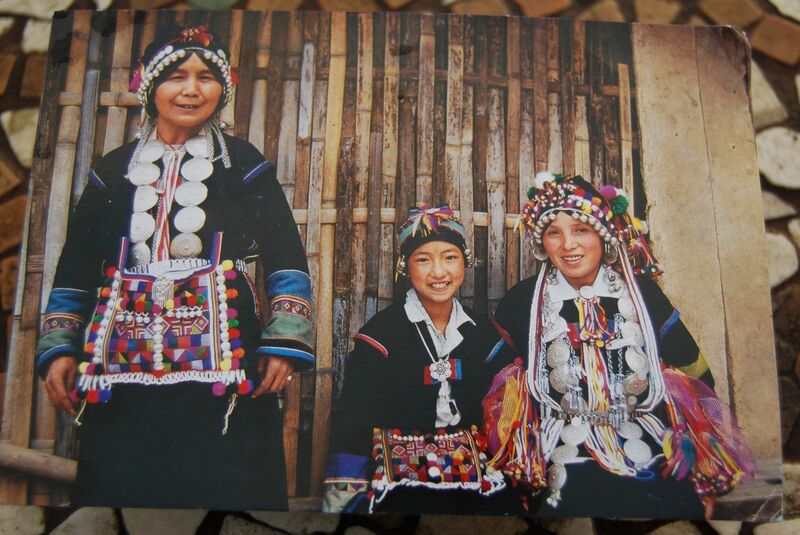 I have never seen my dear wife in colourful Yunnan gear, but it's a good look. I can imagine that going down really well on the streets of our tiny little English city. Along with the postcard, W of B had slipped me a length of "2014 Xiaohusai Yikeshu". It took some serious Googling to unpack the name of this tea: "xiaohusai" is, it seems, in the Xibanshan region of Mengku. (Booyeah! 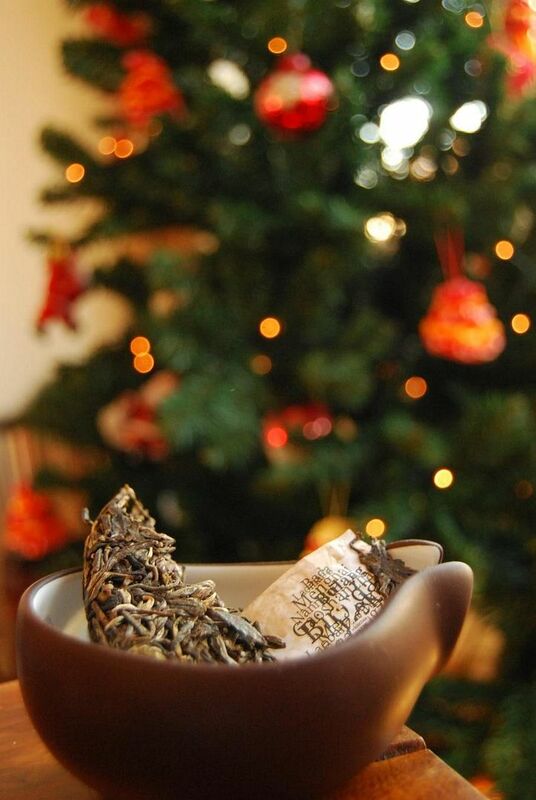 methinks, for I delight most heartily in Mengku teas.) Further Googlation reveals that "yikeshu" means "single tree". I consider myself edumacated after so much a'Googlin. W of B notes that this is one of his "red" teas, but, even then, it is really good. I kick back and try to avoid my MONOLITHIC OVERBEARING ALLCONSUMING prejudice concerning red pu'ercha, and instead get down to enjoying it. It is fresh, crisp, and very clean - for some reason, I seem to enjoy its delicacy and sweetness. 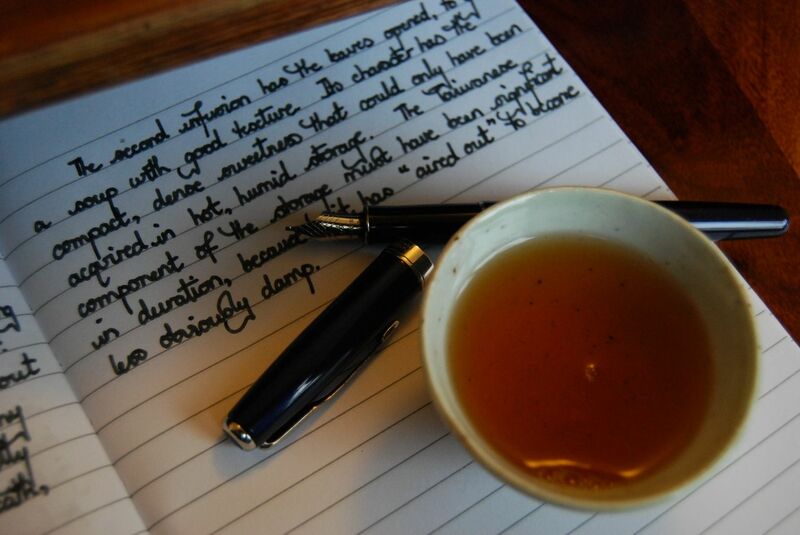 "I am reminded of selections from Essence of Tea", my diary has, which is surely a compliment, given the precision targetting of your average EoT ordnance. I slam the entire sample into the pot, because, hey, red tea is pretty much impossible to overbrew. The result is as big and as fat as your proverbial mother. It's very good - and I begin to suspect that those trademarked Mengku lovebites are making their mark on my affections. As if my magic, a laser-guided payload of EoT 2014 "Longlanxu" then arrives on target. 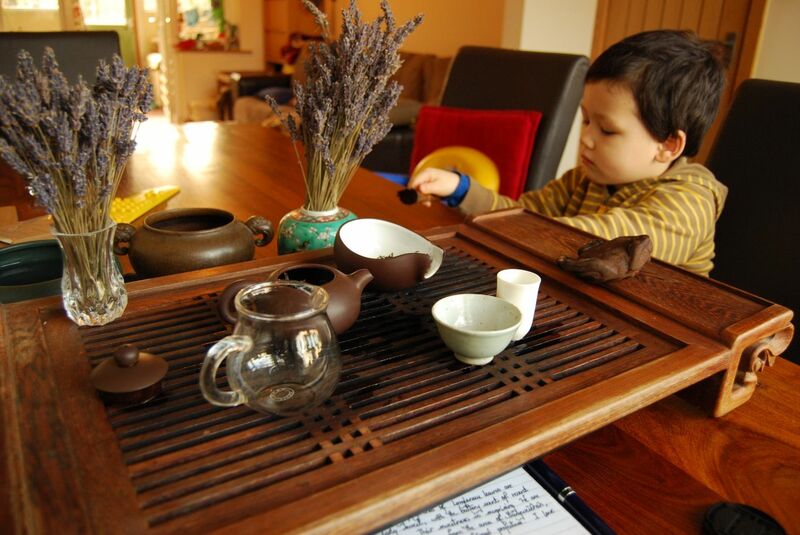 The eldest of my two sons, Xiaohu, seems to have developed a genuine capacity to enjoy (i) his father's pu'ercha, and (ii) his father's real ale by the tiny sip. I am stunned, because I can explicitly recall despising both tea and beer until I was at least a teenager, and then some. Happily stunned, it must be said, because I get to live the dream and kick back at the teatable with my big boy. I laugh as I write this, because I clearly remember being very interested in his opinion of the teas that come past our teatable - he is my independent validation set. Additional bonus points are scored when Peter Rabbit and his other friends also join us (pictured below). What did Xiaohu think of the 2014 Longlanxu? I think he dug it. It is husky and sweet, and EoT tells us that this cake comes from the Bangweishan zone of Lancang County in Simao. If there's anything I like as much as Mengku / Lincang tea, it's Simao tea. They are seriously A1 remarkable about their mixture out there. Tangy, punchy, eternal on the breath - it has the noticeably tannic sandpaperiness of good grapes for a good white wine. 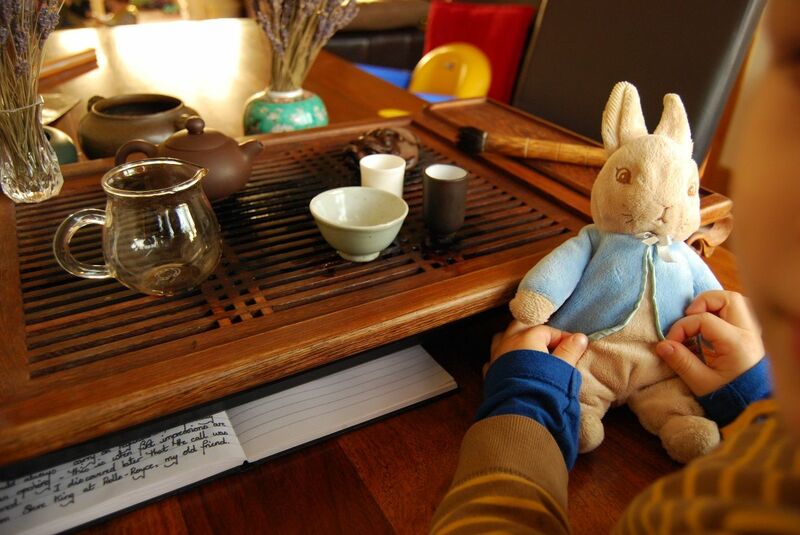 I am baffled how Xiaohu seems to enjoy his (tiny sips of) this tea, but he's sipping happily. The uncanny part is that he has a slightly distant gaze as if he's actually tasting it. Amazing. Many teas are made weak by time and fate, and by agrochemicals - but not this one. 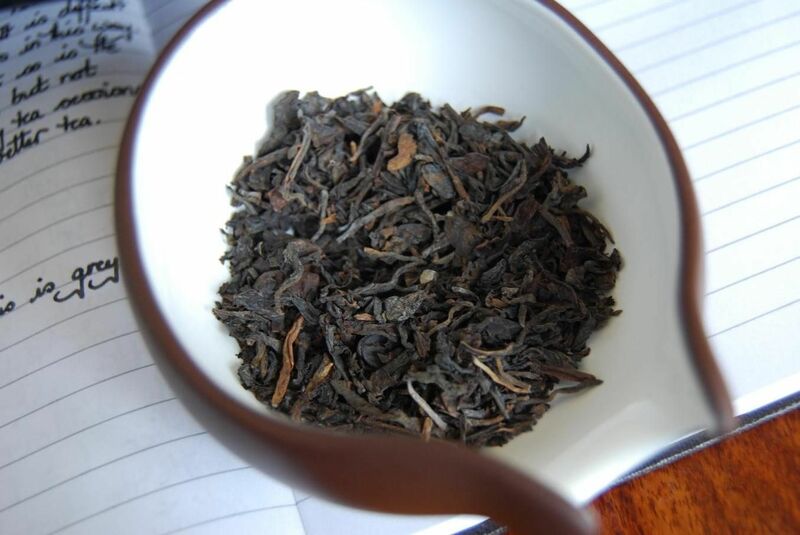 At £48, this is very good, and I seem to remember that it was the clear winner (by a long shot) when I tried the 2014 EoTs in their maocha form. I like it, and more importantly, Xiaohu likes it. Gentle Reader, let us parley. I have three good 'uns for you this fine morn: one solid, one stanking (sic), and one that could only be described as being like the planet-eating deity, Unicron. Let us open the batting with "solid". Ah, the delights of the pre-dawn sesh. It is called "burning the candle at both ends": aiming to have something resembling a social life in the evening, after the dear children have been coaxed to bed, and then rising early to have some tea, being paradoxically unable to sleep, even though immensely tired. Thusly, tired, and yet unable to sleep, I make matters yet worse by taking on a hefty slug of caffeine. It is a cycle that I have, at the time of writing, managed to break simply by going to bed immediately after my children, for a night or two. Sleep heals all wounds, and I have latterly discovered my love of it. I have become rather good at sleeping, in fact, and have made something of a hobby of it. 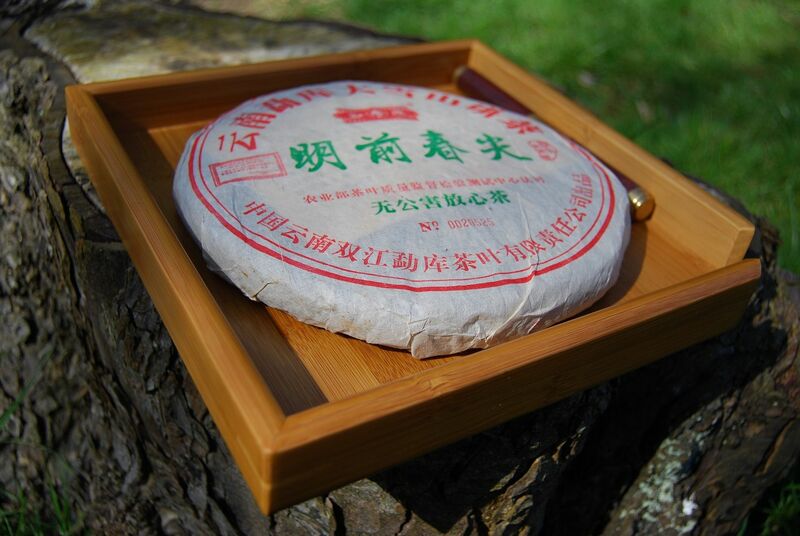 The "solid" cake is the 2007 Chenyuanhao "Guafeng Laozhai". I cannot recall from whence cometh this one, but it might be Dubs, or the now-vanished Origin. Or someone else. 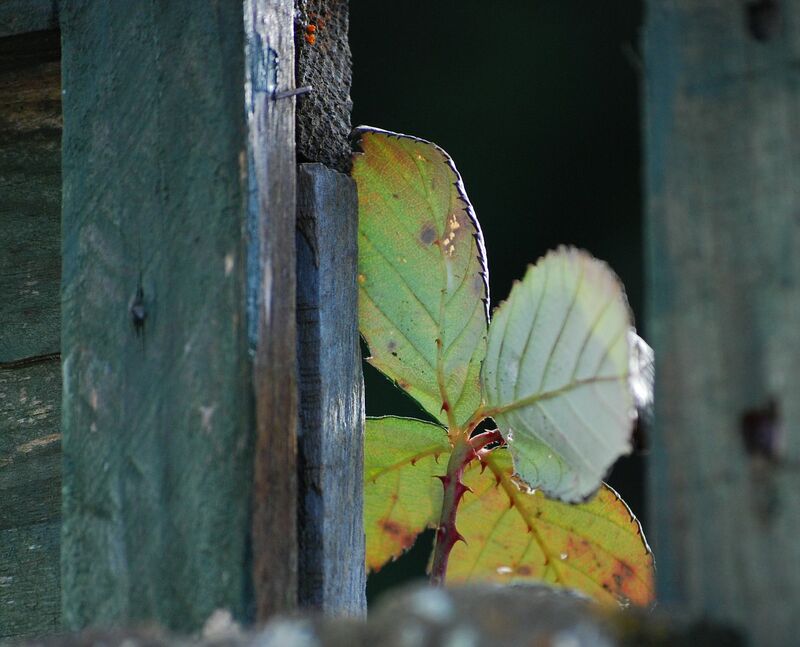 The leaves, pictured top, are unusually dark, even at 4.30 a.m., and they have a mightily-enticing scent of tobacco. I am a vicarious tobacco consumer, initially from my father's distant pipesmoke, as he puffed beyond the jurisdiction of my mother, at the end of the garden, and more recently via pu'ercha. This cake, like much of Daddy's pipeleaf, is solid, sweet, and rather clean. 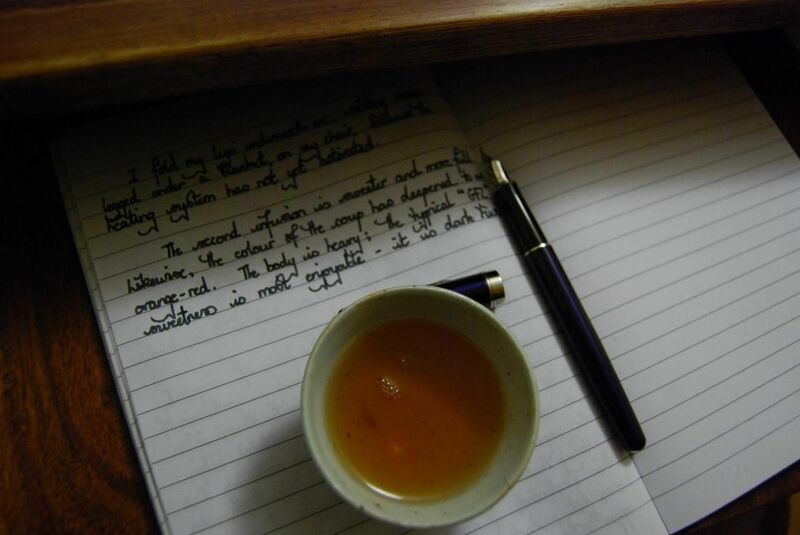 Unlike the contents of the patriarchal pipe, this tea also has a note of fishiness to it. That is not a matter of immediate concern, given that almost everything out of Japan (and the tea! ho ho) smells of fish. 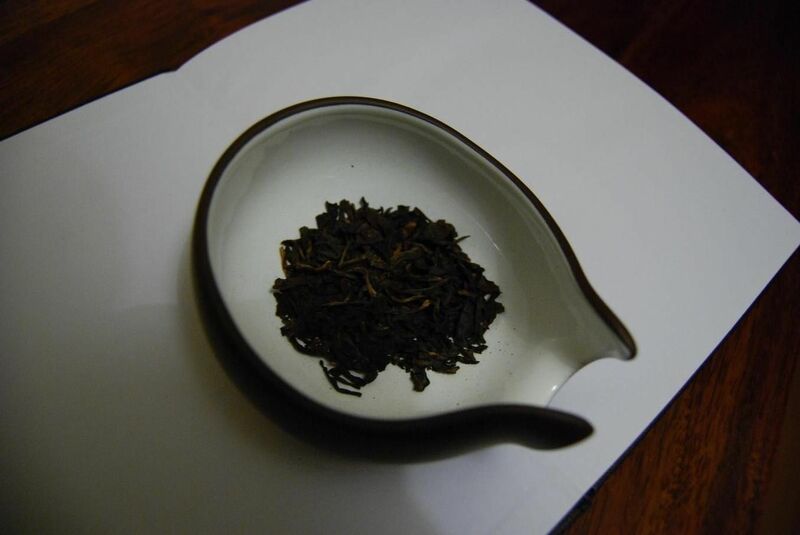 It is a full and heavy little tea; its "GFZ" character is typical, and, therefore, welcome. I liked it, but not enough to pursue. 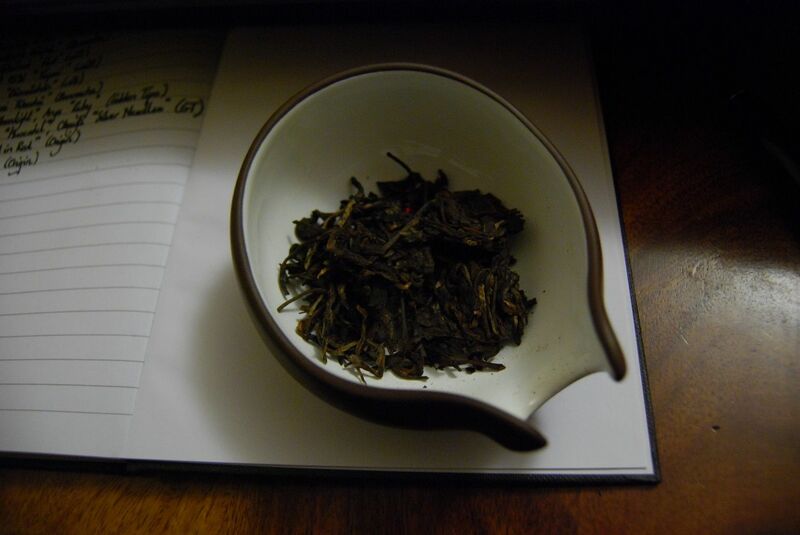 The "stanking" tea is the 2001 Changtai "Red", from Dubs. My diary has, and I quote directly, "This tea stinks, like Nurgle." For those few of you not familiar with the collected works of Games Workshop (i.e., for anyone who has not previously been a teenage British male), Nurgle is the Plaguebringer, a deity of pestilence and decay. He looks like a smiling, fat Buddha, except he is green and decomposing. 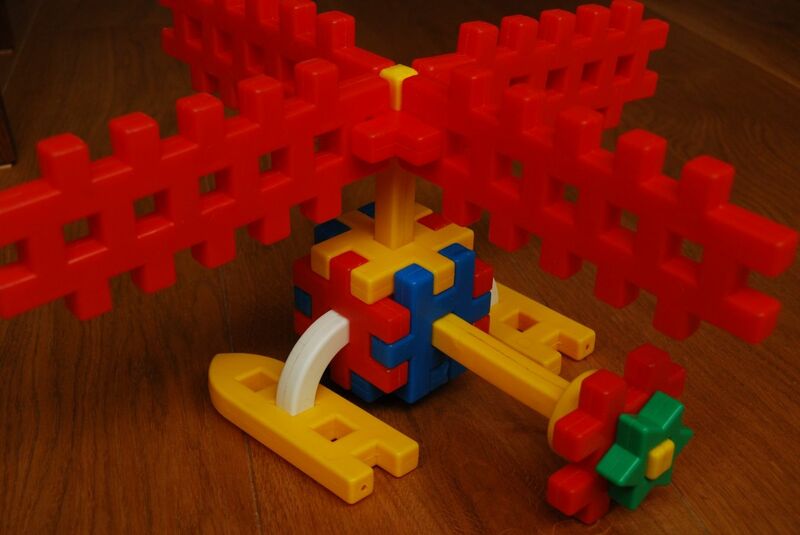 The 2001 Changtai cake is exactly like this. This is $150 from Dubs, and the cake is grey (grey!) with humidity. I like my tea so wet that it's likely to decompose before it gets brewed, and so this appeals to me greatly. I like teas that have been colonised by as-yet undiscovered bacteria, which may or may not confer super-powers on the imbiber. "Heavy minerals" notes my diary, which is par for the course. Its tangy, humid warmth pushes its way through the dried-out soul. However, as you might expect, the excessive pestilence of this cake has given with one hand, only to take away with the other. It does not endure, and the fairly low (for its age) price reflects its various qualities and limitations. And then there was the Unicron. I really like this cake. It is the 2000 CNNP 7532 "Tiepai", from the aforelinked Dubs. You know this is a cake that needs to be owned the minute that you break it open. Does the above image convey a sense of thickness? I think it looks rather like a serious claret. 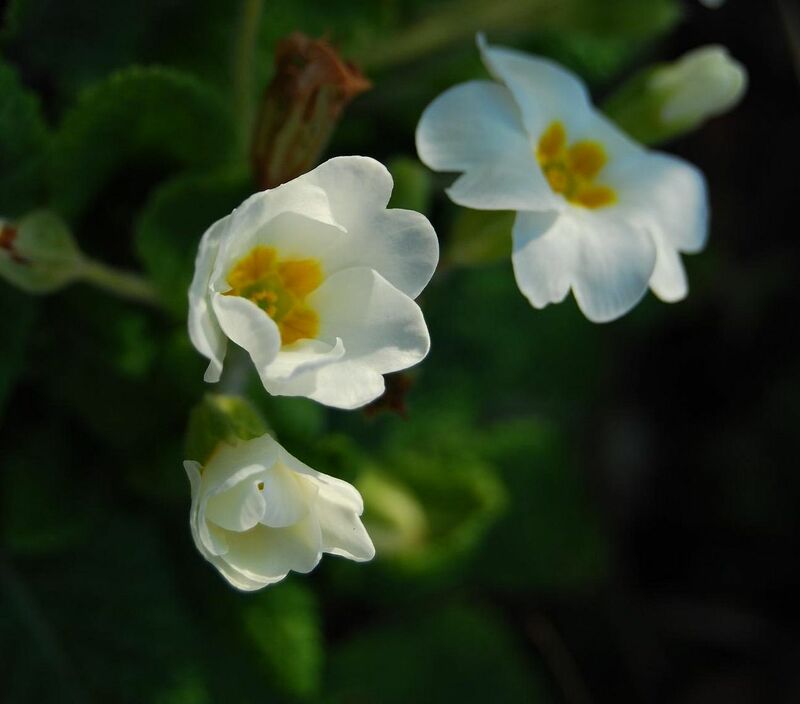 You probably cannot detect, from the photograph, its sweet and floral scent, even though it has the dark red-brown character of good age. Unlike many other cakes of this (comparatively reasonable) price-range, which is $140, its scents and residual aftertaste are well-developed, and suggestive both of good leaves and good storage. I must confess that I brewed the entire 25g of the sample to gain this degree of thickness, but that's fair game. The result is Unicron, plain and simple, crunching his way through planet after planet. "This tiepai cake is pure blackness." Note that "tiepai", meaning "pasted brand", refers to the probability that this cake is some sort of unorthodox pretender, dressed in an authentic 7532 wrapper. That said, one has to keep an open mind. If the wrapper contains Unicron, then it's all good. Sometimes, you don't need your world to be rocked. Sometimes, settling for "aww yeah" is just fine. Sometimes, a pu'ercha simply doesn't need to kick derrieres, nor take names. Today is one of those times. Both of these cakes came from the now-departed splendour of Origin Tea, which has sailed off into the Undying Lands of Elvenkind, far out across the western oceans, beyond the sunset. The first of the fine pair of E-Z (zed) listening cakes is something named "1990s Round Tea", which is probably an English rendering of "yuancha", a straightforward descriptor for bingcha. I wish I'd discovered Origin before I did: as it happens, I should be grateful for discovering it just before it closed up shop, a few weeks before it set sail. 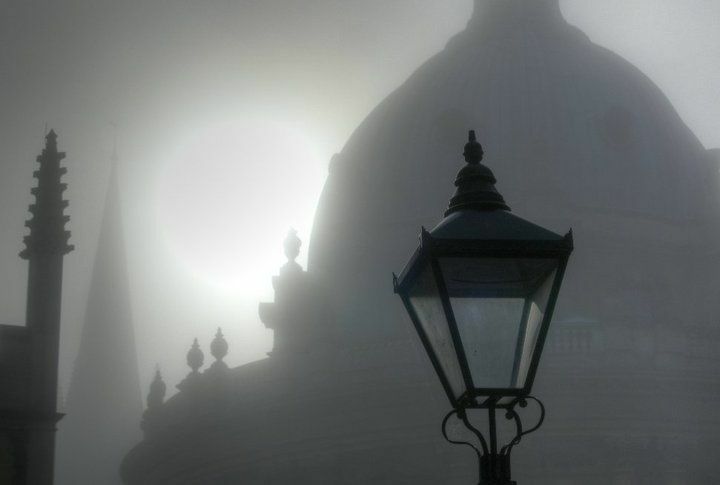 As the photography might hint, this session kicked off before dawn. A father of two fine young dudes needs to either drink before dawn, or not at all. 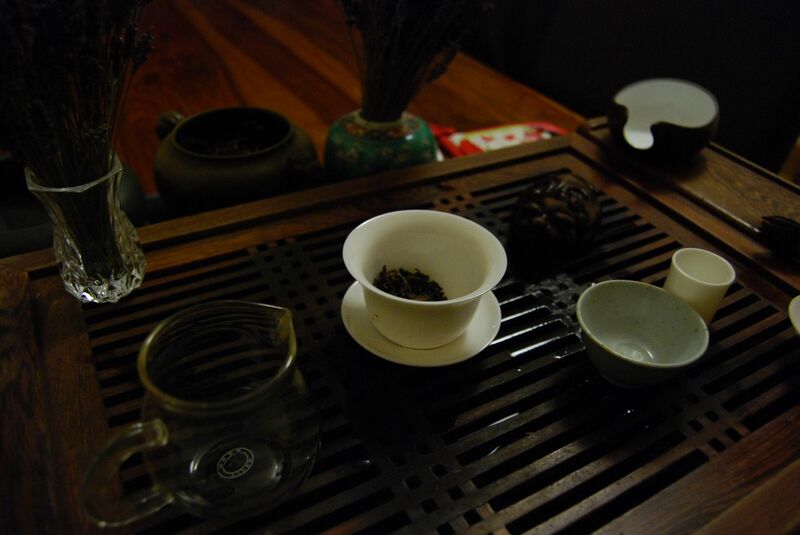 Before dawn is a good time to drink teas in the E-Z (zed) listening genre. 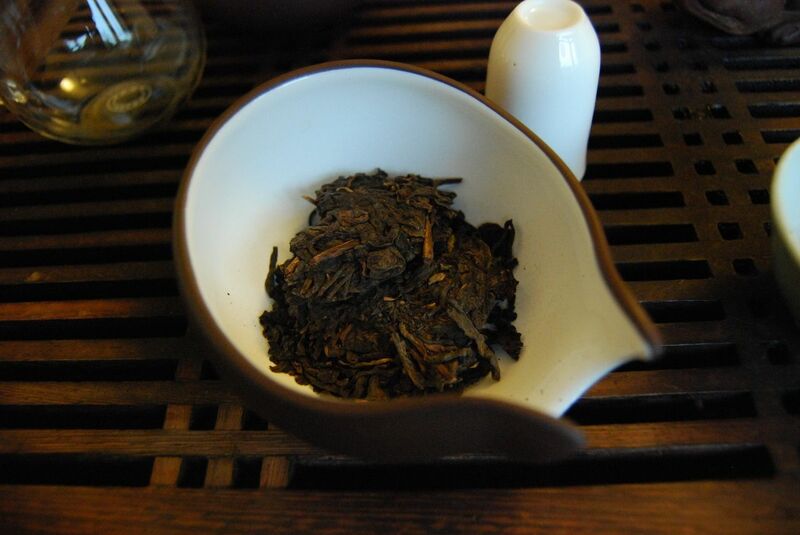 This particular "round tea" is crisp and pinewood in its sweetness. It needs a lot of brewing, straight for the get-go, to get anything resembling character out of it. 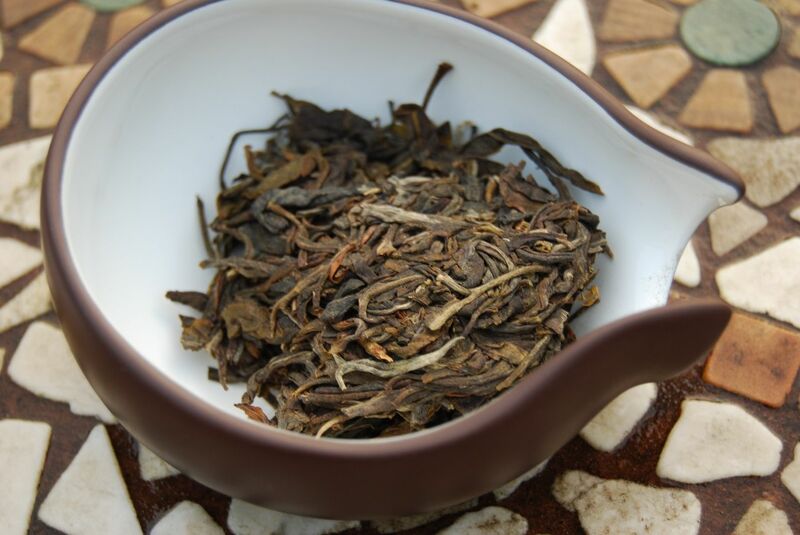 Uncomplicated and tangy, it is a basic tea that has been aged quite well - presumably HK following by Taiwan, if this follows the pattern of other Origin Teas. The nondescript name of the tea is fitting for its character, but that's OK.
Not every tea has to shake the world. Also from t'Origin, here cometh the 1999 Kunming "Red in Red". There's something rather smug about these "X in Y" names that rubs me up the wrong way. I cannot quite put my finger on it, but something is ab-so-lutely wrong about Westerners using this phrase, even though it is a straightforward translation of a phrase that simply describes a zhongcha character in its usual encirclement of eight other zhong characters. The irritation I feel for the affected nonsense of the phrase "X in Y" is not unlike the irritation I feel concerning use of the phrase "tea master". Just a personal beef there. And aren't personal beefs the best kind of beefs? No-one likes impersonal beef, after all. Tar-like, cloying, and strong, this is More Like It. 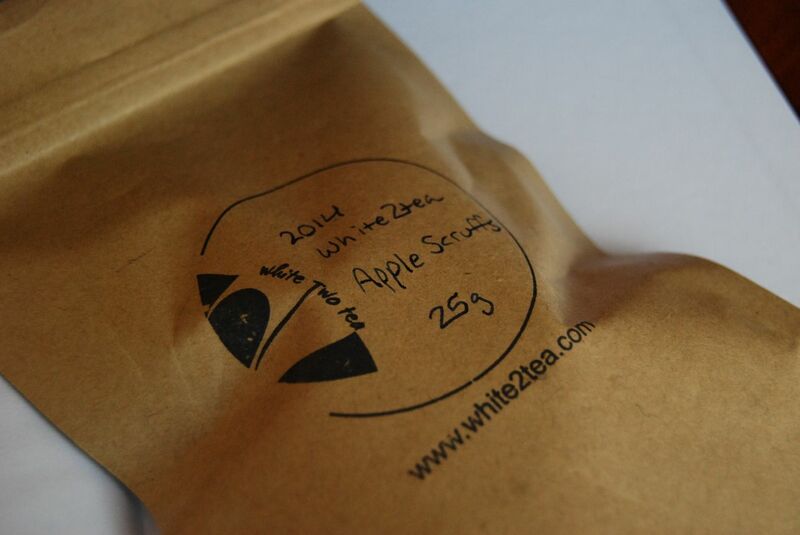 There is compact, dense sweetness that could only have been acquired from hot and humid storage. The Taiwanese component of the storage, if it existed, must have been significant in duration, because it has "aired out" considerably. Some activity remains on the tongue, suggesting that the humidity has not claimed the entirety of this cake's soul. It is not particularly complex, but it endures. 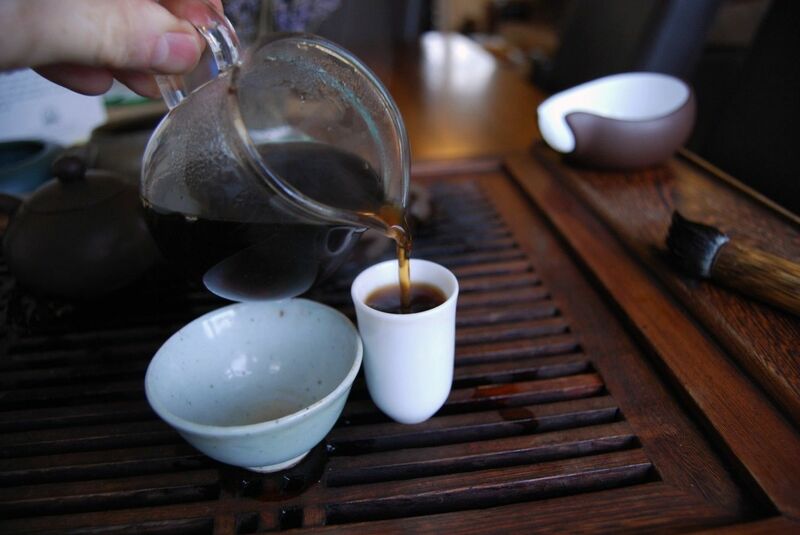 Pu'ercha is so very satisfying: even a straightforward tea such as this makes for a comforting and enjoyable session.